“A video of a man dumping what appears to be ice water on a baby is stirring lots of controversy despite his attempt to donate to a good cause. Reggie Stewart, of Houston, posted the video to his Facebook page as a part of the ice bucket challenge to benefit the ALS Association. 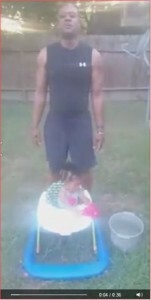 As Stewart calls out others to do the challenge, his granddaughter sits in front of him trying to grab the bucket of water just out of reach. “I’ve been called out for the ALS Ice Bucket Challenge… and my granddaughter … is going to do it with me,” Stewart said in the video.